The summer is finally here. This time I would just like to bring to your attention Switchfoot's new single, Awakening. As you can see by reading my review of their album here, that I correctly predicted that this would be the next single and it is a good one at that. The new music video, which I will post at the end of this article, was released about a month ago but I have yet to hear it on the radio or see it on MTV. Hopefully it will get some airplay this summer. This video is great, one of my favorites from Switchfoot. As a avid guitar hero fan, I found this video to accurately portray the average Guitar Hero addict. The music video is hilarious and the song is great, not much more to say. Check it out. 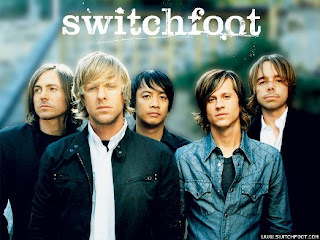 Switchfoot is a post-grunge band from California that made it big in 2003 with "Meant to Live" and "Dare you to Move" off their album The Beautiful Letdown. That album is one of favorite albums of the last few years. There is not one song on that album that I would ever think of skipping over. They then went on to release Nothing Is Sound with a fairly big hit "Stars". I was not as impressed with this effort as their previous album but there were plenty of songs to note, such as "Lonely Nation" and "The Shadow Proves the Sunshine". Then came Oh! Gravity., released on December 26th 2006 with 12 new tracks (3 bonus tracks at the end) and a running time of 51:57. This is their third album in four years and they continue touring rigorously. They are really dedicated to their fans and it shows. The album kicks off with their new single "Oh! Gravity", a song full of energy with politically charged lyrics. This is nothing new for them, as a lot of their previous songs have spoken out on political issues. The next song, "American Dream" is more of a social commentary on society's infatuation with money and material wealth. It has the same kind of high energy as "Oh! Gravity" which is not really my style. I think that yelling shows the passion for their message but these songs can do with out it. Next up is "Dirty Second Hands", song about how time flies and that you should make the most of it. This is where the album starts to turn around in my opinion. With "Dirty Second Hands" you can see that this album has the makings of a great album and the next song, "Awakening" only further proves this. "Awakening" is the kind of song that Switchfoot has been creating for years and the reason why I think that they are such a good band. I predict that this song will be there next single and be a bigger hit then "Oh! Gravity". It seems that the trend with Switchfoot is to release the hard rock song first and then follow it up with a more mellow song. This song really showcases lead singer Jon Foreman's voice and the lyrics display a longing for something better which remind me of "More than Fine". Next up, they slow it down a little with "Circles". With lyrics of struggling through daily life with a search for meaning, the song evokes emotions of desperation. Another favorite of mine is up next with "Amateur Lovers", a more upbeat song musically. The lyrics speak truth about the search for love and the recklessness that pursues. The seventh song on this album, "Faust, Midas, And Myself" is another good song. This song expresses a lot of the same messages of Switchfoot pasts songs. It is about regret and that you should be careful in the life you lead. We are now halfway through the album and ready for "Head over Heels (In This Life)". This song is great and makes me begin to think that this album has the potential to be just as good as "The Beautiful Letdown". This song sounds like a classic Switchfoot song and a classic alternative rock love song. "Yesterdays" is up next, this song will run chills up your spine. If you have recently lost someone close to you, this song could be playing on repeat for the next couple of months. It is a beautiful song about grieving and holding on to someone who has passed on. The next song, "Burn Out Bright", is another song about living life to the fullest and how short life is. It's a short song that picks you up after such a sad song, "Yesterdays". The next song is known only as "4:12" as it refers to the time mentioned in the lyrics and also to the length of the song. This song refers again to the materialist society we live in and that our dreams should be more than obtaining wealth. "Let Your Love Be Strong" is the last new song on the album. This song is about finding hope in the face of despair and holding on to "your love". The album ends with acoustic versions of "American Dream" and "Awakening". They also throw in a remix of "C'mon, C'mon", which I believe is previously unreleased. These are great bonuses for the dedicated Switchfoot fan. This album is everything that I hoped it would be and definitely fulfilled my expectations. I wasn't crazy about "Nothing is Sound", though it had it's moments. I believe that "Oh! Gravity." is a step back in the right direction and it is nice to see that Switchfoot is consistently releasing great music. I would highly recommend picking up Oh! Gravity. and I give it 4 and 1/2 stars out of 5. I'll end this review with a couple links for you.